SILENCE: Can Zoe change all-electric perception? Renault’s fourth all-electric UK vehicle – the Zoe – aims to silence sceptics who claim it is just a run-around second car for wealthy families. Launched this week, the Zoe, available from £13,995 after a government grant, puts electric vehicles within range of more people, Renault have countered. 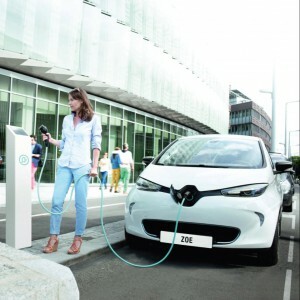 Other electrics typically cost closer to £30,000 after grants, but Renault compare Zoe ownership to buying and running a £14,000 Ford Fiesta and refuelling once a month. Zoe customers are charged from £70 a month to lease the batteries which power it, with a wall box to charge the car included in the price. However, other savings on the Zoe include exemption from road tax, BIK and London’s congestion charge. A spokesperson for Renault told headlineauto: “A Zoe is 75% cheaper per mile to fuel than a diesel car and 25% cheaper per mile to service and maintain. “There are already 1,700 public charging points, and these are scattered around the country and not all in London and in many cases parking and charging in them is free. Public reaction to all-electric cars is centred on anxiety, with many worried about costs, running out of battery power and battery life expectancy. However, Zoe batteries will be replaced or repaired once they can no longer hold more than 75% of maximum charge any time within ten years. Renault claim one charge can last 90-100miles in summer and around 65miles in winter, when heaters, lights and wipers are in use for longer periods.